Nui Than Tai Hot Spring Park in Danang is a project invested by DHC Suoi Doi Joint Stock Company (a company member of DHC Investment Joint Stock Company). With the total investment capital is up to 500 billion VND, Nui Than Tai Hot Spring Park is the project that investor desires to bring an attractive tourist destination and to preserve a invaluable natural resource for the next generations, such as "mineral water resources". 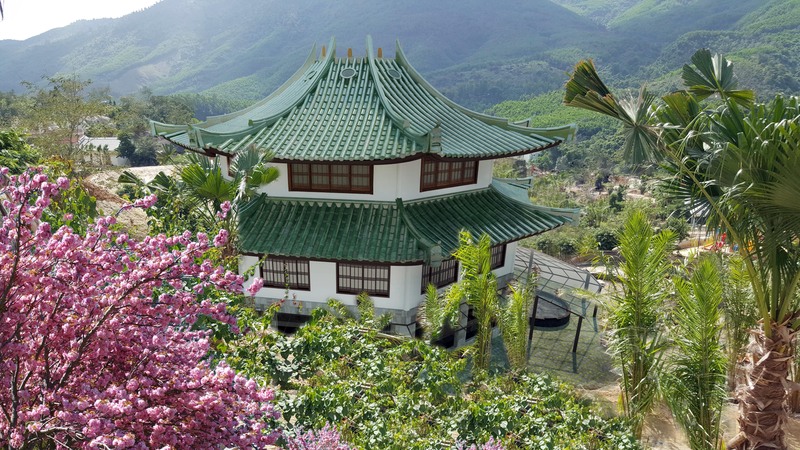 Nestled in the Ba Na–Nui Chua Nature Reserve, Phu Tuc Village, Hoa Phu Commune, Hoa Vang District, Da nang City, the Nui Than Tai Hot Spring Park Vietnam is a perfect venue for central Viet Nam region that cover an area of 60ha. The project is in the sea city but the climate here is specific climate of Ba Na with 4 seasons in a day. Reminding the hot spring, we often imagine a fiery sky and the not suitable for central climate that is extreme heat. But coming to Nui Than Tai Hot Spring Park in Danang Vietnam, you will experience a sense of complete difference, being immersed in nature with majestic primeval forests of t the Ba Na–Nui Chua Nature Reserve and the cool streams. And only here you can feel the heat of mineral and cold of headwater streams clearly. Nui Than Tai Hot Spring Vietnam originates from the sacred Ba Na and surrounded by Thanh Long hills Bach Ho hills, and unearthed in Phu tuc Village. Hot mineral springs are found as a predestined for Da Nang city at a time when the tourism product from rivers, mountains, the sea have been developed and became popular. The Service of hot spring resort is considered as a different product that offer exciting experiences and contribute to renewable energy, mineral supplements. Therefore, you no longer worry about dry skin after a soaking in the sea, on the contrary, you will feel fresh, "cool" because the necessary minerals for both the skin and the body was added through natural hot mineral water. Coming to Nui Than Tai Hot Spring park Da Nang in Vietnam, you will enjoy the services of a professional team, operated by experts from Japan, which is known as the hometown of hot mineral water. For Vietnamese tourists, this will be an international travel experience in the heart of Da Nang, gives you the feeling of difference, not simply a hot mineral bath. Nui Than Tai Hot Spring park Da Nang was officially put into use from April 27th, 2016 with the work items of phase 1 including: Mineral hot spring bath area, VIP Mineral hot spring house,luxury hotels, mud bath, green tea bath, coffee bath, milk bath, spa, children’s playing zone, Long Tien Cave impressed with lazy river, modern karaoke system, luxury restaurant, souvenir shop system,and many other interesting places. Especially, visitors will have opportunities to gain experience of "onsen bath" service according to Japanese standards appeared first time in Vietnam. On June 3rd, 2016, Nui Than Tai Hot Spring park Danang was officially opened and marked improvement in all items, especially, the Ebisu 4 - star hotel system hotel has been put into use to serve the needs of visitors to stay and relax. The water park has been officially started with the enjoyable waterslides, wave pools, jacuzzi, black holes ... when being put into use, the water park promises as a new emphasis for visitor when coming to hot spring park in Vietnam. It is expected to be completed and put into use in the end of 2016.